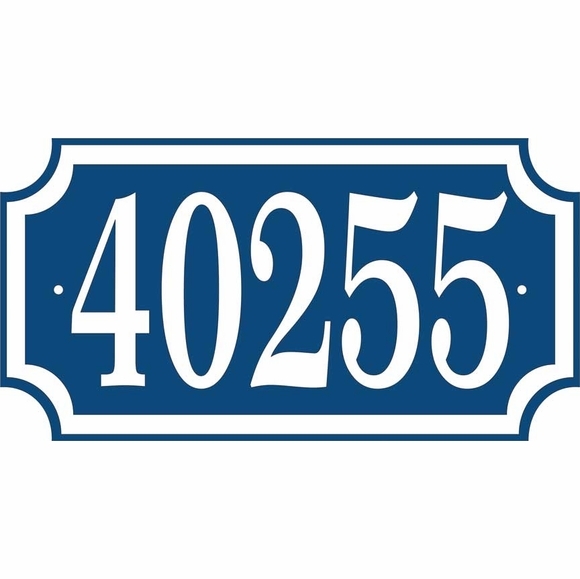 Comfort House Scalloped Rectangle Address Sign - - one-line house number plaque holds up to five 4" high numbers or letters. Made in USA. Fast turnaround; ships in 1-2 days. Made from sturdy and UV-stabilized laminated acrylic with engraved personalization. Dimensions: 11.5"W x 6"H x 1/8". Withstands temperatures to 175-degrees F without deforming. Comes with two 3/16" diameter fastener holes and mounting screws. Nine vivid color combinations: black with gold characters; sky blue with white characters; black with white characters; white with black characters; brushed gold with black characters; brushed stainless with black characters; kelley green with white characters; red with white characters; and yellow with black characters. Border is the same color as the personalization and accentuates the scalloped semi-circular corners. Laminated acrylic address plaques crafted in the USA by skilled artisans to assure the highest quality. NEW! See how it looks with your address in our Address Plaque Lab. Thank you to our client (who wished to remain anonymous) for submitting the above picture of her sky blue sign with address 5524. Great, prompt service. Excellent quality materials.